Many caravan sites are located in beautiful settings, but for people new to a site it is often difficult to know where to start – many ViewRangers are keen caravanners so we have written this post to highlight some of their favourite walks near caravan sites. The walks are all free to download from ViewRanger and have been uploaded by Harry Brown, Anne Dockerill, Mike Roberts and Ian Hopkins. The Goyt Valley is situated east of Macclesfield and this 12 mile walk provides easy hiking and some spectacular views over varied terrain. The highlight of which is the view from the top of the valley, looking down over the River Goyt. This walk is located near the Goyt Valley Camping & Caravans site, SK23 7HD. Wandlebury is situated just south of Cambridge and is a welcome retreat for both walkers and nature lovers. A particular highlight of this area is the remains of a 5th Century BC Iron Age Fort in which this walk circles. 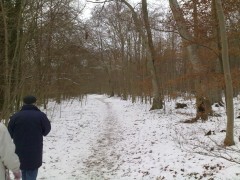 The route also touches on Clark’s Corner, a 9 acre wood mainly comprising of Beech. The woodland is managed to ensure this ecosystem is maintained. The walk is near to Cambridge Camping and Caravan Club, CB22 5NB. This 6 mile walk is located in the east of the New forest. The walk includes fields, riverside and even an old railway track. The New Forest is famed for its countryside and wildlife and this walk is no exception. Mike, the author of this route also recommends the Elm Tree Pub (pictured) for a bite to eat after the walk. The walk is near to the New Forest, Gaddens Close Farm caravan site, BH24 3DB. Finally, this 3.5 mile walk in Anglesey features a lovely route along the Rhosneigr beach, followed by a loop around Lake Maelog. The route is also directly beneath the flight path of a nearby RAF base, which provides excellent entertainment as you enjoy the scenery around you. The walk is located nearby Rhosneigr caravan site, LL64, 5QZ. Hopefully our suggestions have inspired you to embrace the unknown countryside next time you go on a caravanning holiday. See what you think of our walks and if you know any better routes upload them and let us know your top tips on Twitter or Facebook! Even better, geotag some photos to your route so we can all share the experience!